Spark a new fire of creativity in your organization – train your team in new skills. Being aware of and fully competent in all the features and capabilities of ever-evolving technologies allows developers to see new opportunities to apply them. New ideas then just seem to sprout up everywhere, and business challenges get met with inventive solutions. Besides starting a landslide of innovation in your organization, you’ll be making an investment in your staff. Giving them new skill sets engages them in a fresh way. It shows you value them and may be the best way to retain them, too. Bring your development team up to speed in the latest .NET and Accelerator technologies and watch the results! We offer public courses at our Surround Offices that are open to anyone. Having your staff away from the office can put a full focus on learning. We can also conduct our courses at your company's facility or a location of your choice. We can customize our courses to meet the unique needs of your organization. Your staff will learn in the comfort and convenience of their own environment. This can sometimes minimize interruptions to your daily business operations. Your education does not have to end when you leave the classroom. 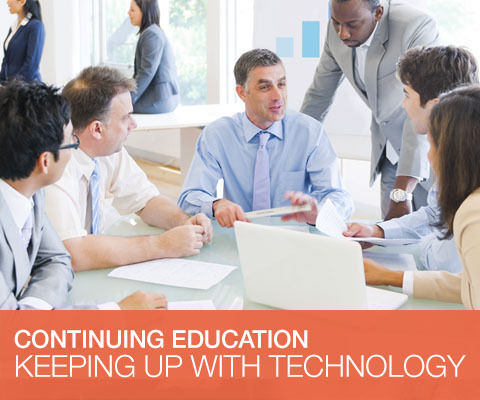 Utilize Surround's experienced consultants to help apply what is learned in class. By working side-by-side with your staff on your project, we can provide skills transfer, answer any questions, and help apply what was learned in class to your unique situation. This course pulls together the concepts of Accelerated Software Development and developing with Accelerator. The focus is on best practices for software architecture and development to create a foundation for a streamlined, efficient, and effective development process with a "get it done - results matter" philosophy. This course goes through the fundamentals of the Accelerator architecture, software generation, and Accelerated Software Development processes to get you up and developing with Accelerator fast and effectively. Prerequisites: a working knowledge of developing in .NET. Surround's "Microsoft .NET General Development" and "Microsoft .NET Windows Development" courses cover the material necessary. Developing with Accelerator is the same as developing in .NET itself. Accelerator makes it easier, faster, and better. This course quickly goes through the process of creating and modifying a Windows based application. Then it focuses on best practices for developing with .NET and how those best practices are implemented with Accelerator. It also discusses the Accelerator Standards, customizing those standards and maintaining them throughout development. The course can be tailored to go through the development of an application using a portion of your database and other specific customer needs. Prerequisites: Accelerator Fundamentals and a working knowledge of developing in .NET and WPF. They should be comfortable with general .NET and WPF development concepts and the Visual Studio Development Environment, otherwise they should take .NET training courses for this. Surround's "Microsoft .NET General Development" and "Microsoft .NET Windows Development" courses cover the material necessary. Developing with Accelerator is the same as developing in .NET itself. Accelerator makes it easier, faster, and better. This course quickly goes through the process of creating and modifying a Responsive Web application. Then it focuses on best practices for developing with .NET and how those best practices are implemented with Accelerator. It also discusses the Accelerator Standards, customizing those standards and maintaining them throughout development. Prerequisites: Accelerator Fundamentals and a working knowledge of developing in .NET and ASP.NET MVC. They should be comfortable with general .NET and Responsive Web development concepts and the Visual Studio Development Environment, otherwise they should take .NET training courses for this. Surround's "Microsoft .NET General Development" and "Microsoft .NET Windows Development" courses cover the material necessary. An introductory crash course for developers with very little knowledge of .NET but do have experience in other software development technologies. The class focuses on .NET development the way we do it with Accelerator as a building block to that development. A crash course for developing Windows Application using Microsoft's .NET Windows Presentation Foundation (WPF) development technologies. Prerequisites: Microsoft .NET General Development or equivalent. A crash course for developing Responsive Web Applications using Microsoft's ASP.NET MVC development technologies along with the Bootstrap Frameworks. Our "Microsoft .NET General Development," "Microsoft .NET Windows Development," and "Microsoft .NET Responsive Web Development" courses customized for IBM i and System z developers with very little knowledge of .NET but do have experience in software development such as RPG, Cobol, LANSA, Synon, or other Software development technologies. It includes specific lessons for connecting and working with the IBM i or IBM System z using .NET. Perfect for the IBM i or IBM System z Developer to get up and going with .NET to build new software or modernizing their existing applications. This course covers the Fresche Legacy looksoftware technologies used with Accelerator for transforming your existing IBM i 5250 and IBM System z 3270 screens, defining transaction, and seamlessly embedding them into the robust user experience of Accelerator. Prerequisites: Accelerator Fundamentals and Accelerator Windows or Web Development. For companies looking to ONLY Renew their applications with very little to no "New" development, these course can be tailored to not need the .NET Development Prerequisites.